Graphite-colored metallic-coated concrete floors were a show-stopper in “The Manhattan,” one of the entrants in the 2013 Boise Parade of Homes, adding depth and richness to the white and gray design scheme. 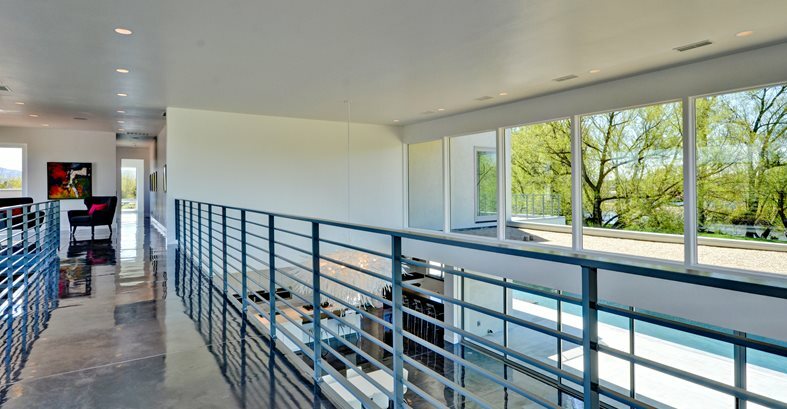 The concrete floor is radiant heated and runs throughout both levels of the two-story home, including the stairway. Despite its dazzling metallic effects, the floor coating doesn’t compete with other design accents in the home, such as the colorful wall art. An upper-level view of the floor. The concrete flooring even extends into the home’s bedrooms, bathrooms and closets. The high-sheen floor mirrors the outdoors through the home’s large expanses of glass. Another view of the floor. 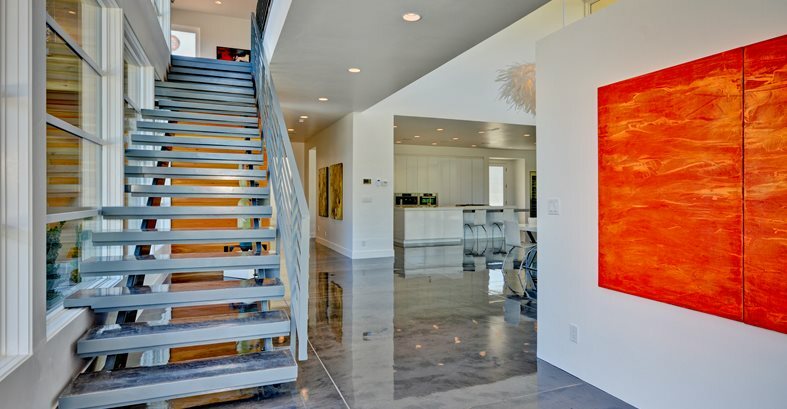 At the 2013 Boise Parade of Homes, sponsored by the Building Contractors Association of Southwest Idaho, an ultra-modern two-story home with decorative concrete floors wowed judges and visitors alike with the chic look of its metallic-coated floors, which flow throughout both stories of the home, including the great room, bedrooms, closets, bathrooms, kitchen and even the stairs. “Almost every single person that came through the show commented on how incredible the floor was,” says homebuilder Steve Martinez of Tradewinds General Contracting. Called “The Manhattan,” the 5,200-square-foot open-floor-plan home has a New York City design vibe, with large expanses of floor-to-ceiling windows that take advantage of river and mountain views. The design scheme is primarily white and dark gray, with lots of white lacquer cabinetry and stainless steel. The original intent was to leave all the floors as gray concrete so they would accent the home without competing with the other design elements. But when the time came to make the final decision, concrete coating applicator Tyler Hess of Silverline Systems suggested using the Liquid Dazzle system from Westcoat, a metallic epoxy floor coating that imparts shine and subtle color-changing effects. “Unlike a clear epoxy or sealer, this coating system has a lot of depth. There isn't one area that is the same,” says Martinez. To achieve the look you see here, Hess first applied a base coat of gray epoxy followed by Liquid Dazzle in graphite. “We used a notch trowel, followed by a loop roller, and finished with a spiked roller. We also sprayed the floor with acetone as an accent to create more movement. The overall finish is a one of a kind,” he says. Often the materials and finishes used to construct a Parade of Homes participant are cutting-edge and foreshadow upcoming trends. Martinez says that most of the homes in Idaho are built on a crawlspace instead of a concrete slab, but he is seeing a lot more homes switch to concrete. “The feedback we got from the Parade of Homes was incredible, so I think it will be something that more and more people will be asking for,” he says. Tradewinds General Contracting Inc., Boise, Ida. Architectural Interiors LLC, Eagle, Ida.